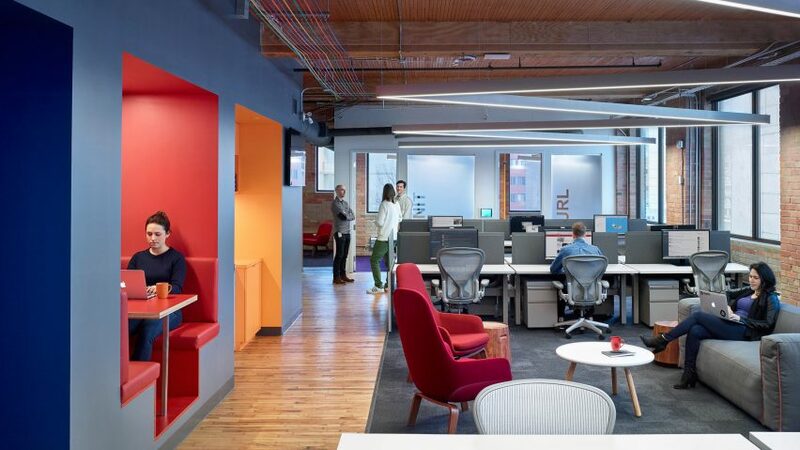 A trail of rainbow-coloured cables, which match brightly hued walls and seating, threads through the Toronto offices of tech company Slack by Dubbeldam Architecture + Design. After starting up in San Francisco, Slack – which provides cloud-based tools for collaborative work – has grown rapidly and opened offices in Vancouver, New York, Melbourne, London, and Dublin. "Each office occupies a former industrial building with interiors that honour the property's legacy, renew its productivity, and reflect Slack's values of empathy, solidarity, and craftsmanship," said a project statement. The same is true for the new Toronto outpost, which occupies 23,000 square feet (2,140 square metres) over three storeys of a former knitting and textile factory in the city's Downtown area. Taking the building's previous use as a starting point for the design, Dubbeldam came up with the theme of "threads of communication" to guide the project. This resulted in several linear installations through the space, including light fixtures that zigzag across the ceilings and a collection of networking cables that follow a route around the work areas. These cords, which match Slack's brand colours, are used to create patterns on walls in some areas and run along the ceiling as a group in others. "These enliven the space in an homage to the lines of yarn that were used in the mechanised knitting process, while also referencing the communication service of the messaging application itself," said the team. The same hues were chosen to decorate a series of niches for informal meetings – each finished entirely in a different bold shade – and for upholstery on seating in the reception and lounge areas. Also in reception, Kathryn Walter of Felt Studio has laid diagonal strips of industrial felt in various shades grey over the walls and ceiling, to create "a warm and inviting environment as soon as you step into the office". Colour is used to identify the different areas of the office, such as meeting rooms, staff lounges and an executive boardroom. "Each zone corresponds to a single colour that comprises Slack's branding, reinforcing company identity while also providing visual interest and relief to the otherwise yellow tones of the brick and wood interiors," the team said. Other distinctive features in the offices are large white pegboard walls, where pegs are used to spell out the company name, its motto "where work happens", and other motivational slogans. In the cafe, millwork surfaces comprise diagonal slats of Baltic birch wood, painted white. Tables and chairs, from office furniture brand Actiu, can be stacked away to make room for the majority of the 140 employees when large group activities take place. "The result is a fresh take on an old space that is serious about work while offering a playful and comfortable space for its employees to succeed," said the team. Slack's office in New York is less colourful. Its pared-back design by Snøhetta includes wooden bleachers and planted screens, intended to evoke the city's urban courtyards.